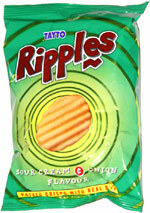 Taste test: These wide-rippled potato chips had a soft crunch and a creamy onion taste. The flavor was pretty good, but it wasn't a particularly sharp or intense flavor. Tatyo packed a whole lot of chips into this small bag.